When vacuums became available to the public, they were a godsend. They were an easier way to clean carpets and rugs. But they aren’t the only thing you need to do to keep your carpets cleaning. We are a carpet cleaning company in Ottawa with many years of experience. This guide will give you some tips to help keep your carpets and area rugs as clean as possible. One of the easiest ways to help keep your carpets clean is to limit the amount of dirt that comes into contact with them. You could put a no shoes rule into effect, or you could put doormats at every doorway. You should also try to find a vacuum cleaner that is easy to use, and focus your efforts on areas that is likely to have a build-up of dirt. This includes areas near an outside door, and areas that have a high volume of foot traffic. It can also be helpful to deep clean the rugs and carpets on a regular basis. You may want to do this yourself, or you can find a professional carpet cleaning company who will be able to do this for you. There is an abundance of stain removal remedies that you probably have in your home. However, how you treat a stain does depend on what kind of stain it is and the type of carpet you have. You might want to try to remove the stain yourself, but if you aren’t sure what it is, or you aren’t sure what your carpet is made from, you should probably call a professional company. Synthetic - Routinely vacuum your carpet, and blot any spills. 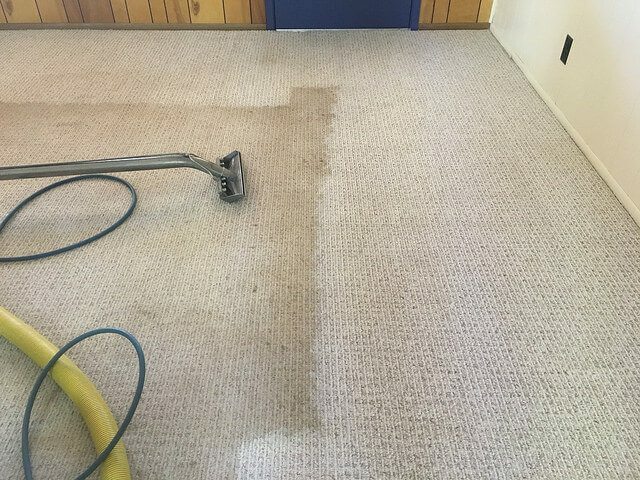 You can steam clean synthetic carpets yourself to deep clean them, or wall to wall carpets may require a professional company to do this for you. Always test any cleaning solutions on a small hidden area first. There is another test that can give you an idea of how a cleaner will react, but it isn’t foolproof. Put a few drops of cleaner on a saucer and let it evaporate. You can use a hairdryer to help with this. If dried residue is sticky, then it will probably leave a sticky residue on your carpets. Wool - You can routinely vacuum wool carpets but you may want to be careful about which vacuum tools you use as some of them can cause wool carpets to fuzz. You should clean spills with water, and blotting. Some cleaning solutions can damage the wool. You probably shouldn’t try to deep clean a wool carpet on your own. Wool absorbs more water than synthetic carpets, which makes them harder to dry, and many of the carpet cleaners that are readily available will damage the wool. You should always call a professional company to deep clean a wool carpet. Plant - Plant carpets are becoming more popular, but they can be difficult to maintain. You should regularly vacuum, and try to remove as much dirt and grit as possible as it causes excessive wear. Water and liquids can be very damaging to plant fibers so blot the spill as soon as possible, and dry quickly using a fan or a hairdryer. You should never attempt to deep clean a plant carpet. They can only be deep cleaned using dry methods, which are best left to a professional. If you do decide to deep clean your carpet on your own, you should steam clean it. Every steam cleaner will have its own instructions, but the basic process should remain the same. Vacuum the area first to remove as much dirt and dust as possible. This makes it much easier to steam clean the carpet. Add a cleaning solution. Take care not to add too much, and always perform a patch test. Start in a corner and work your way backwards. Take care not to walk over wet carpet, and if you must, put some plastic booties, or carrier bags over your shoes. Go over the carpet several times to remove all traces of the cleaner. Dry the area as quickly as possible. You can use fans, and your air conditioner to speed the process up, or if it’s possible, open up your windows. Regular routine, and deep cleaning schedules can help keep your carpets looking their absolute best, but accidents happen and disasters occur. If you’re unsure about how to deal with a problem, consult a professional for advice.